Add an image to an email. Personalize an email using personalization strings. Describe how AMPscript can be used to personalize an email. Leung checks NTO’s list of requirements. The first is to include a logo image that links to the NTO website. Leung uses an image content block to display the logo at the top of the email message. Let’s see how she does this. 1. Open the email editor. 2. Drag Image Block to the email canvas. 3. Click the image block to open the block editor. 4. Click Browse to locate the image in the Content Builder repository. 6. Add image borders, padding, and alt text. 7. Click Add in the Link section of the block editor. 8. 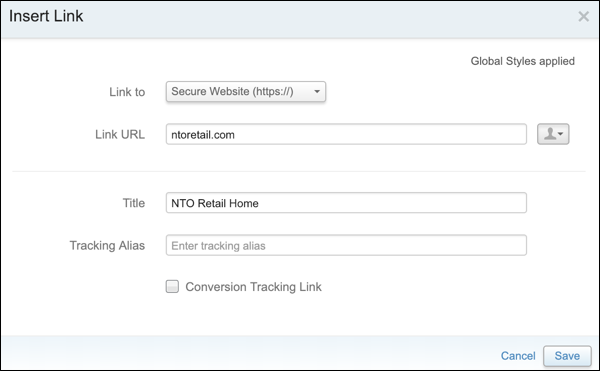 Enter ntoretail.com in the Link URL field and NTO Retail Home in the Title field on the Insert Link form. The image block is all set. Now it’s time to get personal. Leung tackle's the next requirement: add a personalized greeting to the email. She uses a personalization string in an HTML block. While it's true that Content Builder lets you create professional emails without knowing HTML, you can also use an HTML block to work directly with HTML code. Where you write your code is up to you. Use an external HTML editor and paste your code into an HTML block, or use Content Builder’s built-in editor. For this project, Leung uses the built-in HTML editor. It’s teeming with user-friendly features, such as auto-complete, tag matching, color coding, and automatic formatting. Plus, you can easily preview changes in real time. 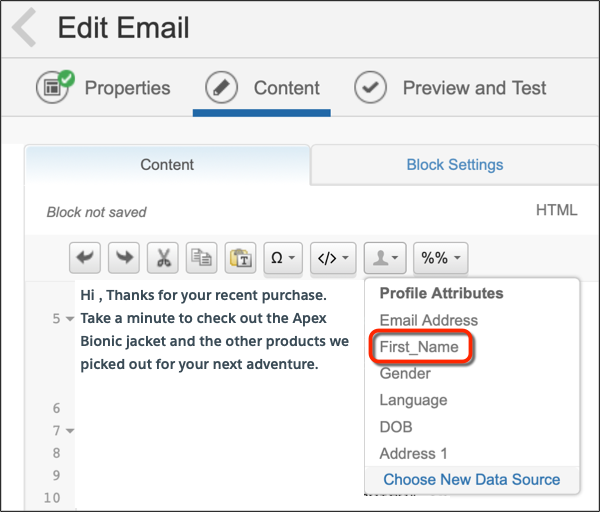 A personalization string lets you insert subscriber attributes, such as subscriber name, or system data, such as campaign ID, into your emails. Leung uses a personalization string to retrieve the subscriber’s first name from a data extension—which is akin to a database table—and insert it into the greeting. 1. Drag the HTML block to the email canvas. 2. Click the block to open the block editor. 3. Enter the HTML code in the HTML edit box. 4. Position the cursor in the HTML code where the subscriber’s name is to be inserted. 5. Click %% to open the Personalization dropdown list. 7. Confirm %%First_Name%% appears in the HTML code. Thanks to personalization strings, the email greets recipients by name. Display content based on certain conditions: Because we’re different, I see a yellow hat and you see a blue jacket. Search in and retrieve relational data from multiple data extensions: Combine subscriber info with travel data. I flew to Lisbon last week and got an email containing a list of Lisbon flights for the same week next year. To learn more, check out the AMPscript documentation in this unit’s resources section. Now you know a quick and easy way to personalize emails using personalization strings and have been introduced to AMPscript for even more personalization options. With all you’ve learned so far, you’ve got a solid Content Builder footing. In the next unit, Leung shows you how to implement advanced content using dynamic and custom blocks.